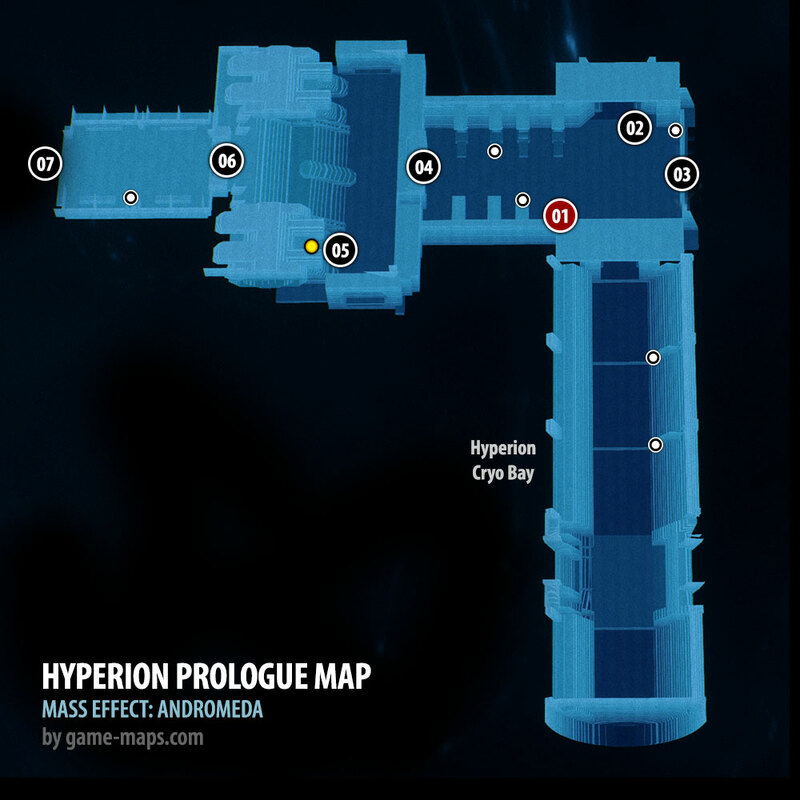 Hyperion Prologue for Mass Effect Andromeda. Atlas with Maps, Game Guide and Walkthrough. Map contains Quest starters, interesting locations, Codex Entries. This is a short tutorial, prologue. You are located on Ark Hyperion, which has just arrived on planet Habitat 7, a place for colonization. Ark Hyperion serves as the main Vessel for carrying human Settlers bound for Andromeda. Named after a Greek mythological figure associated with knowledge of Celestial bodies, the Hyperion represents a breakthrough in intergalactic travel. Substantial money and resources were devoted to its Construction, all privately funded by Jien Garson and the Andromeda lnitiative. and report to the hangar bay. Lexi T'Perro Talk to her. Officially designated as a Simulated Adaptive Matrix (SAM), I am an artificial intelligence that acts as a Coordinating element between Pathfinder Alec Ryder and the rest of his team. My quantum processing power is used to Conduct on-the-spot scans of alien worlds, assist in scientific study or tactical situations, and monitor the team's weapons and equipment. I am physically located on Ark Hyperion, in secure server banks collectively known as SAM Node. You can say "Hello" to all NPCs here, before moveing to next room. Your Omni-tool's Scanner allows you to gather valuable data on alien lifeforms, unknown technologies, and other items. Additionally, it can serve as a diagnostic or forensic tool to aid in field repairs or investigations. An Orange highlight will appear when an object Or lifeform is potentially Scannable and you're within Scanner range. RESEARCH DATA: When Scanning new lifeforms and tech, you may earn Research Data (RD). Data can be spent at a Research Center to unlock blueprints and augmentations for Crafting. How much RD you've acquired is displayed at the bottom of your Scanner. There are three different types of RD. Milky Way: Data related to the Colonists and their equipment. Heleus: Data related to the Various races discovered in Andromeda. Remnant Data: related to mysterious abandoned technology. You will go to Hyperion Bridge. Listen to conversation. Examine Datapad. Talk ot NPCs. Collect helmet and sidearm. Examine Dad's Rock. You are now ready to begin to explore Habitat 7.